The interactions between solar particles and Earth’s magnetic field and the possible damage done by space weather to electronic appliances are the subjects of a study performed by a group of researchers affiliated with the National Space Research Institute (INPE) in São José dos Campos, São Paulo State, Brazil. In collaboration with colleagues at other Latin American institutions, the INPE group is working to install the Embrace Magnetometer Network for South America (Embrace MagNet). By approximately 2022, the group aims to expand the system to more than 20 magnetometers throughout Latin America, including Mexico. Their goal is to study the specific characteristics of magnetic field disturbances over South America and compare their intensities with those occurring elsewhere in the world. “The project is designed to study daily variations in the dynamics of the upper atmosphere [mesosphere and thermosphere] and the electrodynamics of the ionosphere at low latitudes and the equatorial region. We’re interested in seeing how Earth’s magnetic field varies when solar explosions occur and magnetic clouds reach Earth,” said Clezio Marcos De Nardin, head of space and atmospheric sciences at INPE. De Nardin and colleagues recently published two articles on Embrace MagNet in Radio Science, a journal of the American Geophysical Union. The first article describes the network’s scientific objectives and details its design, equipment, and installation and the treatment of the data it produces. In the second article, the authors disclose the initiative’s first scientific results. The design, installation and maintenance of Embrace MagNet is an international initiative hosted by INPE and supported by a FAPESP Thematic Project. The project has also received funding from the National Council for Scientific and Technological Development (CNPq), the Ministry of Education’s Office for Faculty Development (CAPES), the Brazilian Innovation Agency (FINEP) and the Goiás State Research Funding Agency (FAPEG). In Argentina, the initiative has received funding from the Scientific and Technological Research Fund (FonCyT), the National Scientific and Technological Research Council (CONICET) and the University of Tucumán. 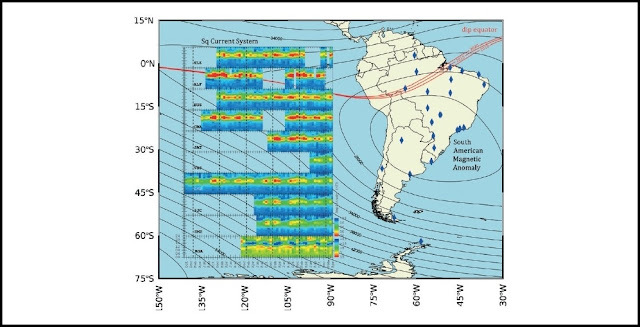 Before Embrace MagNet, South American researchers depended on data from institutions in the US, Europe and Japan to study magnetic field disturbances over South America. “Those institutions’ magnetometers are located in North America, Australia, Europe and Africa. Based on their data, when we heard that the magnetic field was disturbed, we had no idea if the disturbance had reached Brazil or whether we could assume the disturbance occurred in this sector,” De Nardin said. When the magnetic cloud from a solar flare interacts with the terrestrial magnetic field, we perceive this interaction most conspicuously in the form of auroras in the stratosphere over the North and South Poles. The auroras are the only visible expression of the phenomenon; however, interactions among energized solar particles and Earth’s magnetic field cause disturbances around the globe. “In the auroral regions, the interactions of magnetic clouds with the magnetic field creates a system of currents at an altitude of 100 km that can damage equipment on the ground,” said Paulo Roberto Fagundes, a professor at the Paraíba Valley University (UNIVAP) in São José dos Campos, São Paulo State. He is a co-author of the articles and a participant in Embrace MagNet. Solar eruptions cause important phenomena in the magnetic field. Solar eruptions eject electromagnetic radiation (light) and massive amounts of highly energized particles into space. Traveling at more than 2 million km per hour, the particles reach Earth in a few days, bombarding the magnetic field that surrounds and protects the planet. The solar phenomena that reach Earth can cause interference in satellite positioning systems such as GPS. Motor vehicles, aircraft and ships use satellite navigation systems. Depending on its intensity, a solar storm can affect the GPS satellites, severely degrading their operation. The bombardment of Earth’s magnetic field by the fallout from solar eruptions can also damage radar remote sensing systems, induce electric currents in power line transformers and affect the protection of oil and gas pipelines, causing huge economic losses. In the case of power plants, the consequences can be even worse. When a solar magnetic cloud strikes Earth’s magnetic field, auroras appear in the sky and electric currents appear in the ground. In the vicinity of a hydroelectric power plant, the currents can damage transformers and disrupt the grid, causing a blackout. An important case that featured the phenomena described above occurred on March 9, when a huge solar storm and solar flare were produced. Three and a half days later, on March 13, a torrent of energized particles and electrons in the ionosphere induced powerful currents in the ground at various locations in North America. In the Canadian province of Quebec, the current destroyed power transformers and caused a nine-hour outage. Some weather and other satellites lost contact for several hours. The space shuttle Discovery was launched on the day in question, and some of its electronic sensors stopped functioning correctly. “Recent studies published in the journal Risk Analysis estimate that, if a geomagnetic event like the 1989 solar storm were to occur today, it would cause damage amounting to between U$2.4 trillion and U$3.4 trillion globally,” De Nardin said. Hydroelectric power plants built next to large dams and reservoirs are known to be potential targets for the ground currents caused by solar storms. The water in reservoirs boosts current transmission. Worse still, as water flows through turbines in powerhouses, it transmits the current directly to the transformers. A very strong current, such as the one that hit Quebec in 1989, can overheat power transformers so severely that they are destroyed. However, power plants are also at risk from smaller events. Any solar storm causes ground currents that affect transformers, so regular servicing and maintenance are required to avoid complete degradation. Higher or lower frequencies of solar explosions are directly linked to the solar cycle (that is, the solar magnetic activity cycle), which lasts 11 years and is characterized by successive increases and decreases in the number and surface area of sunspots. “At times of peak solar activity, transformer degradation worsens. Papers published by the IEEE [Institute of Electric and Electronics Engineers] based on research conducted in South Africa show that transformers can explode if proper maintenance is not done,” said De Nardin, who is also Deputy Director of the International Space Environment Service (ISES), a collaborative network of space weather service organizations around the globe. Among other purposes, the study of space weather serves to estimate the stresses experienced by the equipment used in power plants and satellite constellations, as well as by oil and gas producers. Based on their analysis of the mountain of data collected every day by Embrace MagNet, Brazilian researchers are developing a specific magnetic K-index for South America that is called the Ksa index. K-indices quantify disturbances in the horizontal component of Earth’s magnetic field and characterize the magnitudes of geomagnetic storms. “Our aim is to produce a K-index specifically for South America, hence the ‘sa’ in the acronym. We already know that what happens in the rest of the world isn’t the same as what happens here,” De Nardin said. When the network is complete, it will consist of 24 magnetometers installed in 16 Brazilian states and Argentina, Chile and Uruguay. Thirteen are now up and running. The latest was installed in the Brazilian municipality of Medianeira, which hosts a campus of the Federal Technological University of Paraná (UTFPR). In addition to studying the magnetic field using Embrace MagNet, the project has also produced an important scientific discovery. “We detected the existence of a fourth layer in the ionosphere, the F4 layer,” said Fagundes, principal investigator for the Thematic Project “Study of the day-to-day variability of the mesosphere, thermosphere and ionosphere at low latitudes and the equatorial region during solar cycle 24”. The ionosphere is the portion of Earth’s upper atmosphere that is found between approximately 60 km and 500 km above the surface. Solar radiation ionizes the atoms and molecules within this layer, creating a layer of electrons. “We knew about the F1, F2 and F3 layers. Now, we’ve discovered F4, the outermost layer, above 350 km in altitude. We’re investigating the mechanism that creates this structure,” Fagundes said.